EVERY totalitarian regime needs its defining myth. With the Nazis, it was the “Aryan” fantasy of racial purity. With the USSR, it was the dictatorship of the proletariat. With secularised, semi-pagan Western societies in historic decline, it is global warming. Sometimes comparisons among these are alarming. For example, Ed Miliband, the climate change minister, has said that opposing wind farms is “socially unacceptable”. How long before global warming denial becomes an offence, like holocaust denial? The Government seizes approvingly on outrageous remarks by such as Dr James Hansen, who wrote in a national newspaper: “The trains carrying coal to power plants are death trains. Coal-fired power plants are factories of death.” What I find bewildering is that the Greens, who claim to care for the environment, are so strongly in favour of wind farms, which are a kind of pollution of the countryside. What’s more, they don’t work very efficiently. So why ruin the countryside for the sake of obsessed environmentalists’ gesture politics? Millions of British people enjoy our glorious countryside as a natural environment which provides an antidote to the stress of urban life. It is nothing short of wickedness to foul this delight with useless wind farms. 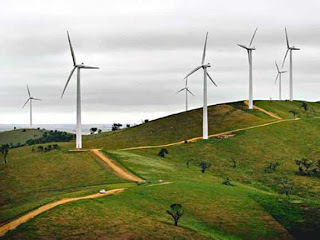 To their credit, some governments are coming to see the uselessness of the wind turbines. Germany and Spain are losing their enthusiasm for wind power because, as reported by The Scientific Alliance, “…of the need to run back-up conventional power stations”. It is meteorologists and other scientists who point out that settled spells of either very hot or very cold weather – the weather that creates the greatest demand for electrical power – occur when there is no wind. So, when electricity demand is at its peak, wind turbines are static and produce nothing. Global warming is not indisputable. Thousands of highly qualified and experienced scientists question it. But the problem is that global warming is not being treated as a theory, a possibility, but as a truth of nature on a par with the law of gravity. It is the unassailable myth of the new totalitarians. I wouldn’t want you to think this is just Mullen shooting from the hip. I have been avidly reading scientific papers and reports and, while there are those who believe global warming is taking place, there are thousands of reputable scientists who deny it. This is entirely as it should be. Rigorous examination of hypotheses is the very basis of science. And this is what is being asked for by, among other intelligent sources, The Scientific Alliance. I quote: “The whole juggernaut of global warming is based on a framework which accepts the International Panel on Climate Change’s view of the enhanced greenhouse effect as indisputable truth. Hence the refusal to concede that any degree of scepticism or a different interpretation of evidence is legitimate. So it is even more important for critical points to be raised and debate encouraged. Scientific understanding will benefit from this: and the better the understanding, the better any necessary response can be formulated.” This is the reasonable approach and a long way from Ed Miliband’s dark words about what is “socially acceptable” and the disgraceful invocation of “death trains”.